I put together three scenario paths of US CPI inflation, shown in the chart below along with the actual outcome through mid-year. The inspiration for that post was a research note by Russell Napier of CLSA written in November 2013 entitled “An ill wind”. In the note, Napier argued that falling export prices from Japan, China and Korea constitute an ill wind from the East that would continue to blow in 2014 risking further declines in inflation in the US, Eurozone and other DM economies. The Consensus at the beginning of 2014 expected US inflation to continue to fall in 1Q14 but then to rise modestly to 1.6% in 4Q14. In the Rising Inflation scenario, stronger US growth against the backdrop of a reduced potential growth rate would result in a quick move up in inflation to 2.5% by yearend. 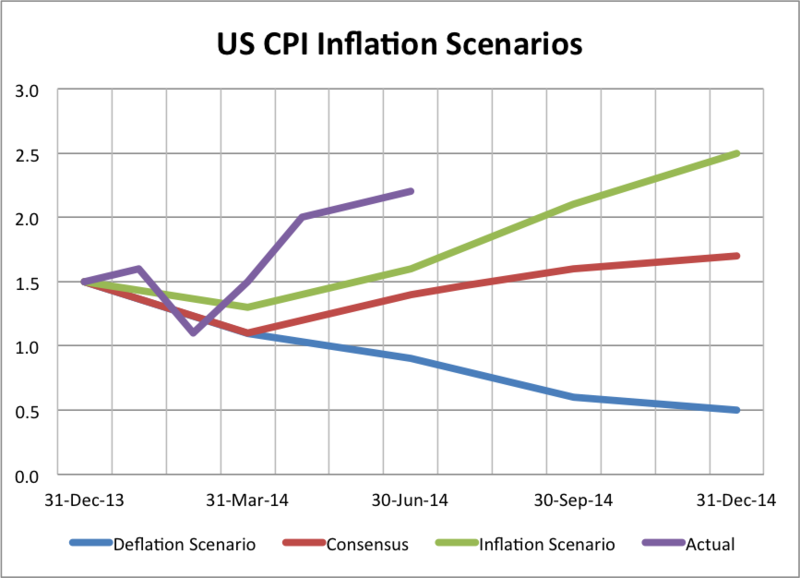 In the Napier-type Deflation scenario, US inflation would continue to drop well below 1% by the end of 2014. The actual inflation outcome for the year through June, due out tomorrow at an expected 2.2%, is much higher than contemplated in any of the scenarios that seemed reasonable at the beginning of the year. Napier’s note got me thinking that preferred portfolio allocation in 2014 would be very different in the three scenarios. I argued in January that either upside surprises on inflation or a move toward deflation could have highly negative outcomes for portfolios. We are now in the midst of a sharp upside surprise on inflation, but all asset classes and portfolios continue to perform well. What gives? Napier’s note drew attention to three leading indicators to keep an eye on to help gauge which direction inflation is likely to take: TIPS-implied inflation (using 5-year break-evens), copper prices, and corporate bond spreads. The charts below show the three scenarios and actual outcomes for Napier’s leading indicators through mid-year 2014. 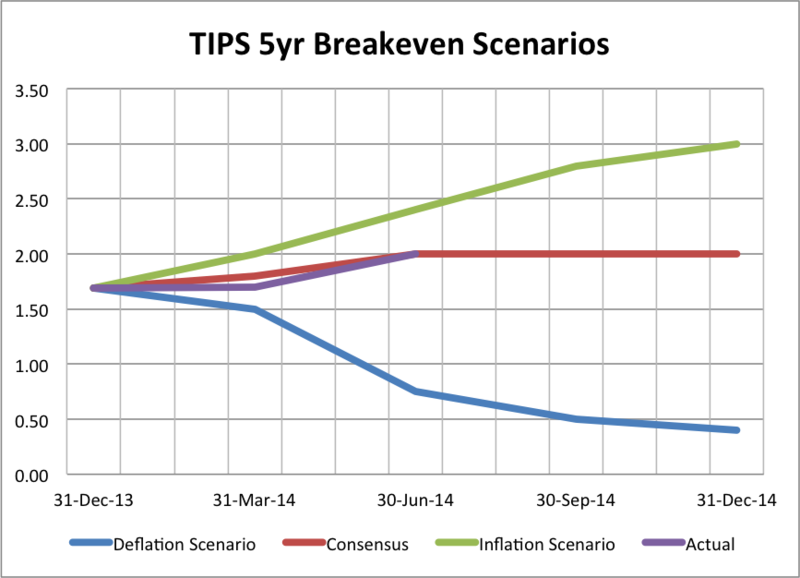 US TIPs Breakevens have closely tracked the consensus scenario despite actual inflation falling short of consensus in 1Q14 and then rising above consensus in 2Q14. 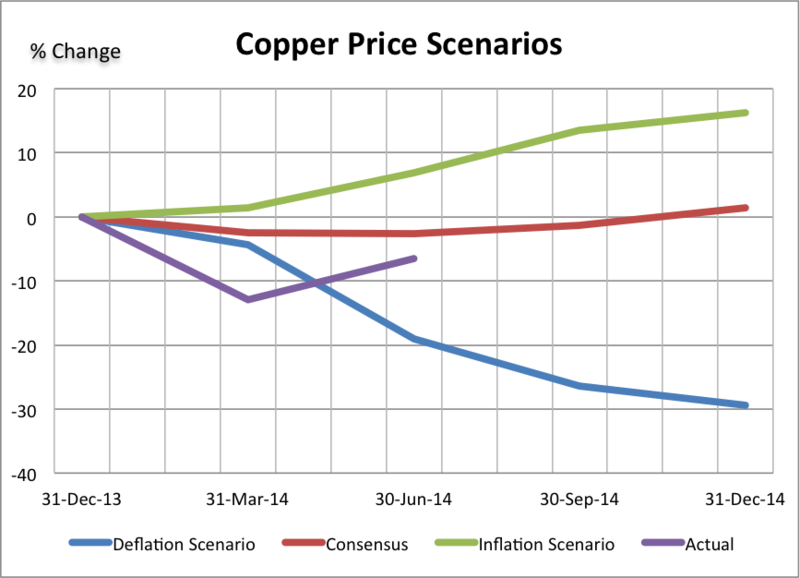 Copper prices tracked below consensus in 1Q14, but firmed in 2Q14. 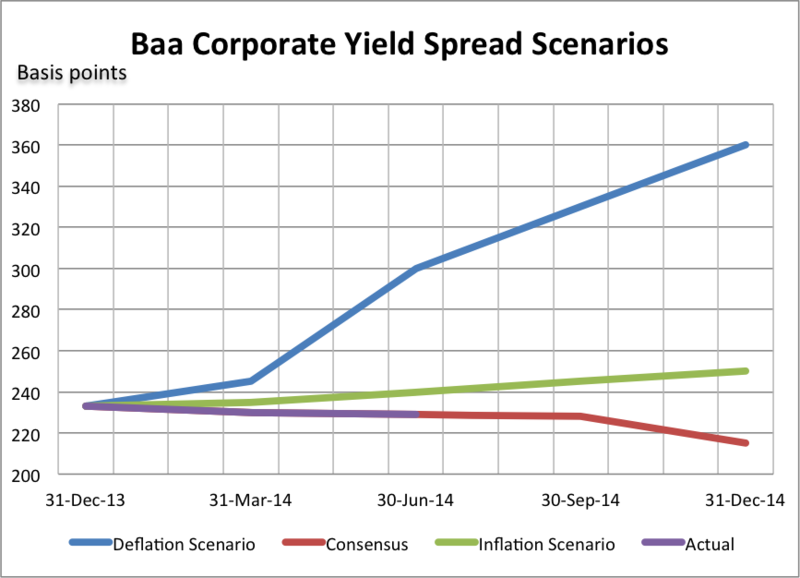 Corporate bond spreads have closely tracked the consensus view. 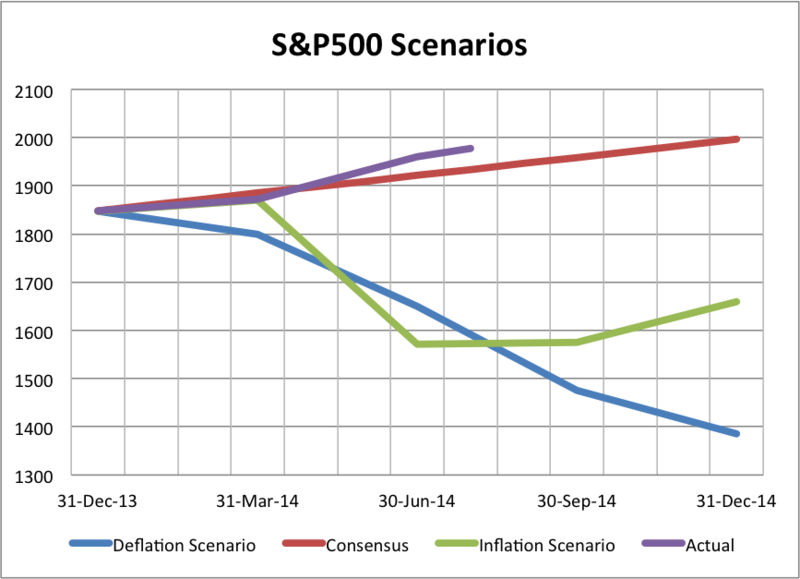 In January, I believed that markets would behave very differently in the three scenarios outlined above. I relied on Napier’s research and my own judgment of recent market correlations to come up with what I believed would be the likely outcomes for key equity (S&P500), bond (10-year US Treasury yield) and currency markets (the Canadian dollar exchange rate USDCAD), which are of particular importance to Canadian investors. The charts below trace out what I thought in January would be the likely paths of these key market indicators in the three different scenarios as well as the actual outcomes. The Consensus scenario expected that with a modest rise in inflation by the end of 2014, the S&P500 would post a decent gain of about 8% to close to 2000, the 10-year UST yield would rise to 3.75% and Canadian dollar would end 2014 little changed with USDCAD at 1.06. The Inflation scenario, which saw a rise in US CPI inflation to 2.5% by the end of this year, would see the S&P500 falling 10% to 1660, the 10-year UST rising to 4.15% and the Canadian dollar strengthening with USDCAD falling to 1.02. 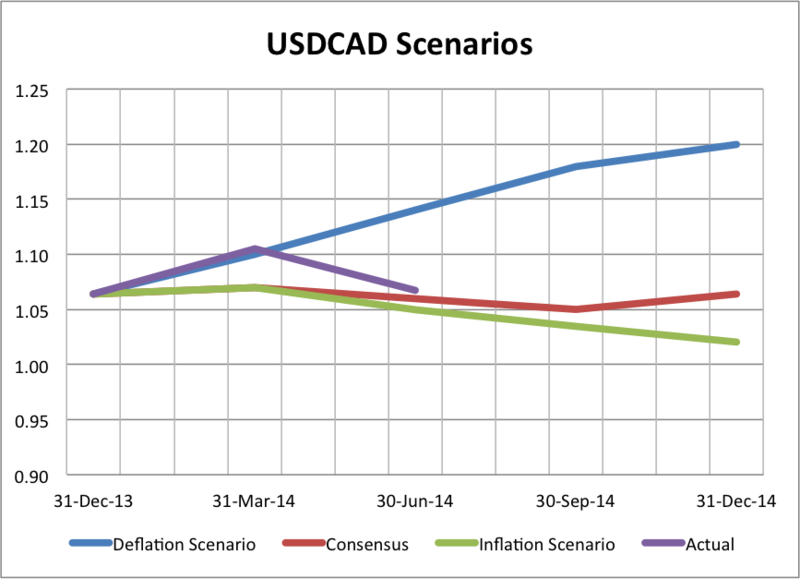 In the Deflation scenario, the S&P500 would likely face a drawdown of 25% at some point in 2014, while the 10-yr UST would fall back to 2.25% and the Canadian dollar would weaken sharply with USDCAD rising to 1.20. 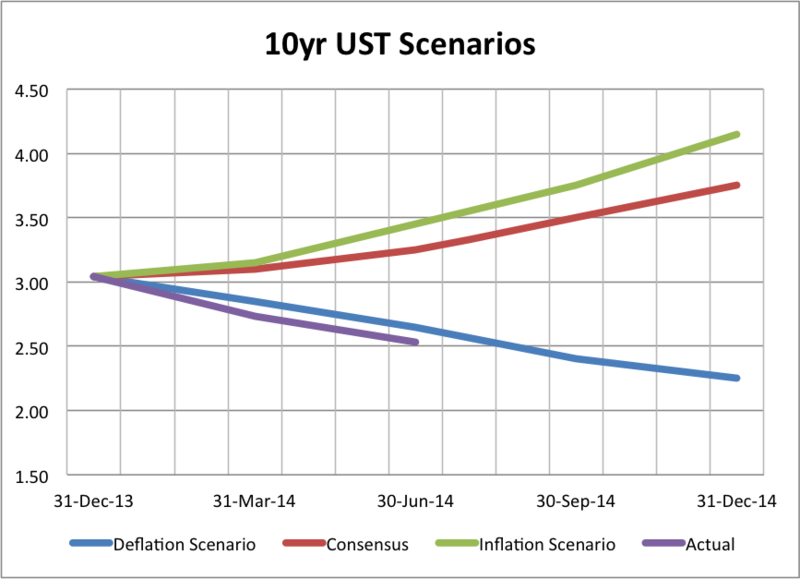 The actual outcomes, year-to-date in 2014 have been that inflation has risen much faster than expected, the S&P500 is already close to reaching the year-end Consensus expectation at 1978, the 10-yr UST is tracking even below the path we assumed for the Deflation scenario at 2.53% and USDCAD, after weakening sharply early in 2014, is back close to the consensus track at 1.073. I argued in January that asset class returns would vary quite dramatically across the three scenarios. 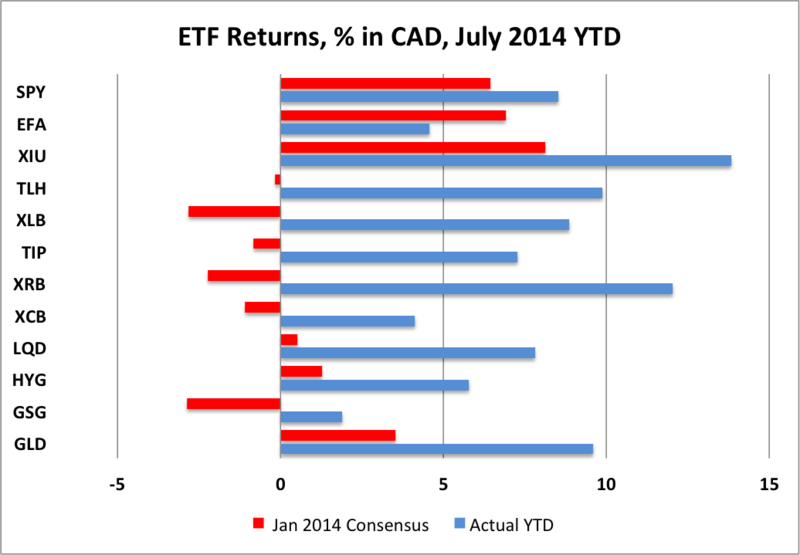 The chart below compares the expected Canadian dollar total returns on the major asset class ETFs under the Consensus scenario with the actual returns for the year to date. What is evident from the chart is that while equities have generated good returns as the Consensus expected, bonds have dramatically outperformed expectations. This was perhaps not surprising in 1Q14 when inflation surprises were tilting toward the Deflation scenario, but it is very surprising that this strong bond performance has endured through mid-year, when the inflation surprises have tilted toward the rising Inflation scenario. Given this set of ETF returns, how have different portfolio structures performed? The chart below shows actual returns for the four different portfolios that I regularly track. The first thing to note is that all four of the portfolios have earned decent returns year-to-date. This is not surprising because all of the asset classes have turned in positive performances. 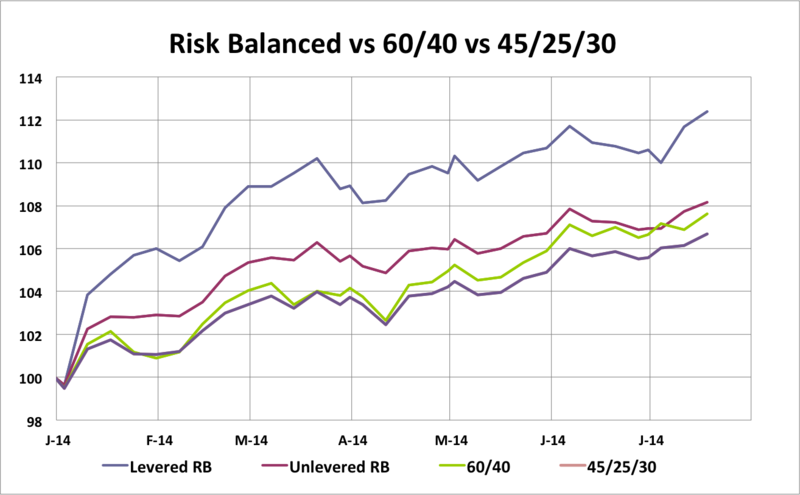 The Levered Risk Balanced Portfolio has outperformed the other three portfolios by 200-350 basis points. What seems strange is that based on the three scenarios, the Levered Risk Balanced Portfolio was expected in January to outperform the other portfolios only in the Deflation scenario. In that scenario it was expected that bond yields would fall and the levered bond positions in the portfolio would perform well. In both the Consensus and Rising Inflation scenarios, the Levered Risk Balanced Portfolio was expected to underperform the other three portfolios, mainly because of its heavier, leveraged allocation to fixed income. In the January post, I noted that, “Looking at the three scenarios, one is struck by the continuing risks to investing in the post-financial-crisis environment, characterized by unconventional monetary policies that have encouraged investors to move into risky assets and led to rich valuations for equities, bonds and credit”. Flaring geopolitical risks including the conflicts in Eastern Ukraine, Iraq and Gaza are supporting flight-to-safety buying of US Treasuries. If one believes that US growth will accelerate, that current high level of geopolitical risk will diminish, and that the Rising Inflation scenario will prevail, my preference at mid-year would still be the conservative 45% Equity, 25% Bond, 30% Cash portfolio. The evolving, highly uncertain environment still argues for a cautious and flexible approach.